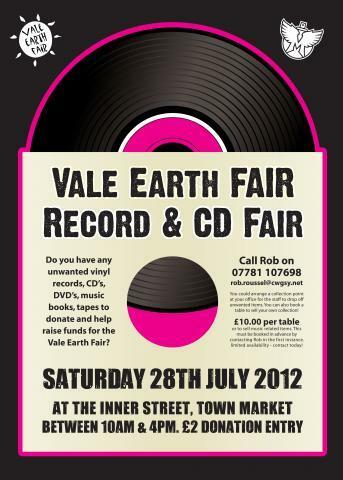 With this year’s Vale Earth Fair fast approaching the Vale Earth Fair Collective are organising more fundraising events. “Following the success of the last record and CD fair in the Inner Market in Town in May, we have decided to hold another one.” Said Collective member Rob Roussel It takes place on Saturday 28th July from 10am until 4pm. If you have stock to sell, please email info@valeearthfair.org. Tables are £10 for one £20 for two or more, although they are limited. If you would like to donate records for sale please email or call Rob on 07781 107698 so collections can be arranged. There will also be live acoustic music in Market Square to entertain shoppers at the Record & CD Fair. All profits from these two events will go towards funding the Vale Earth Fair, which supports a number of humanitarian causes, including the Burma Campaign UK, Free Tibet, Oxfam and Bridge2Haiti. If you want to learn more about the causes the Vale Earth Fair supports, information is available at Vale Earth Fair fundraising events, and there are links on the website: www.valeearthfair.org. This year’s Vale Earth Fair will take place on Sunday 26th August, and the final line up will be announced very soon. “It’s shaping up to be a classic, and we’re all pretty excited about it”, said Rob Roussel. Advance tickets cost £15 for the day, and are already on sale though the Vale Earth Fair website www.valeearthfair.org, and various outlets this week, or £20 at the gate on the day. Children (12 and under) are free if accompanied by an adult.